The original Grinch is back. Enjoy an adaptation of this classic Dickens story set in Baltimore. You can sit with us. Maybe you've read it, seen, performed in it or dreamed it, but this production of A Christmas Carol is one to see. Baltimore's Chesapeake Shakespeare Company (CSC) is bringing back this crowd-pleaser for another holiday season. Whether you observe Christmas or not, this universal tale of redemption is one that connects us. With Mixolo, you don't need a plus-one. All of our events are solo-friendly. Come solo and find your plus-some. 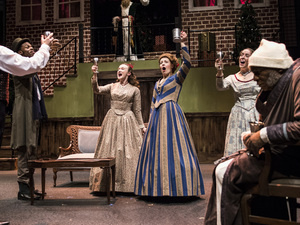 Arrive at 7:00 PM and enjoy some pre-performance cheer and meet your new Mixolo connections with CSC's themed Bob Cratchit's Wassail happy hour. Enjoy your cider spiked or straight.